The V40 Series Rim Exit Devices are secure and durable Panic and Fire Exit Hardware at an economical price. Priced to be the best value for durable and attractive loss prevention panic hardware. For more than a century, DETEX has earned the trust of millions of property owners to secure and protect their people and property. From their newest innovations in life safety and security door hardware, integrated door security systems, and guard tour verification, Detex a USA company, designs and manufactures best in class products with out sacrificing quality. The V40 Series Rim Exit Devices are secure and durable Panic and Fire Exit Hardware at an economical price. Fire-Rated (FV 40) - Device is Fire-Rated for 3 Hours. 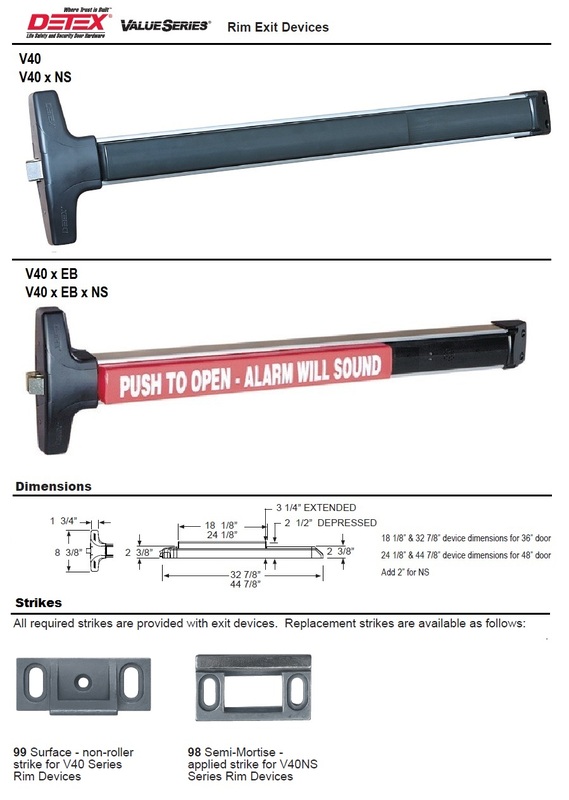 Alarmed Exit Device (EB) - Device includes a 100 dB alarm powered by a 9-Volt Battery, Red Push Bar with "PUSH TO OPEN - ALARM WILL SOUND", LED Display, and Latch Bolt Security Monitoring.